The video of Bow's story is now entered in the World Animal Awareness Society (WA2S) contest to win $10K for Carol's Ferals, if it should win. "The VISION of the World Animal Awareness Society (WA2S.org) is to focus a lens on a wide spectrum of interactions at the human-animal intersection and curate a detailed filmed archive of behaviors in expectation of observing human evolution. The moving image is arguably the rawest, most powerful educational tool we have to witness our behavioral patterns, attitudes and interactions and aid us in our continued growth. By producing compelling documentaries to be shared with the world and providing raw aggregateable footage to educational institutions for further research, the World Animal Awareness Society will accomplish its mission." We think that WA2S's mission to draw attention to and support animal based non-profits, their work and their volunteers, as well as education through video and documentaries is innovative, compassionate and timely. We invite you to visit their website to find out in their words, more than we could ever tell you. In the meantime, please watch the video of the story of Bow, and if you would like to help other kitties like him and the work of Carol's Ferals, please click "Like", comment and/or subscribe to WA2S Youtube channel. Each action counts as a vote and you can vote as often as you like. 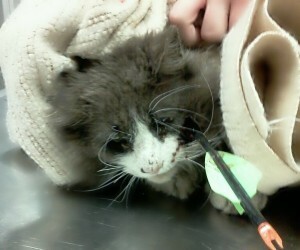 Please share this post, or the post from Carol's Ferals on the Cherry City Kitties facebook page. Thank you to all our friends for your help. MUAH! I have liked the video and shared on Facebook. Sure hope they win. Glad that Bow is all right, poor thing. Thanks for telling us about this. Oh.... we will certainly like the video and go to facebook to check out Carol's Ferals. We hope they win and our heart goes out to sweet little Bow. We have voted for the video on youtube - so pleased that Bow's story has a happy ending and full of admiration for all the wonderful work that Carol's Ferals does. I remember hearing about Bow - I think that was when I discovered Carol's Ferals. Of course I will help them in any way I can! We will definitely do this. Thanks for letting us know. We shared your post on our Facebook page. I had not heard this story a d had to pause the video as I couldn't see it through my tears. Whist an incredible story! We shared on Facebook. Thanks for the info. Thank you everyone for helping get the word out.... Head bonks all around! have liked the video , sure hope they will win ! Our Merry Christmas from our cousin Alexis! Not too much going on round here... MOM! We didn't know we were so sweet! A cool gift for your beans !